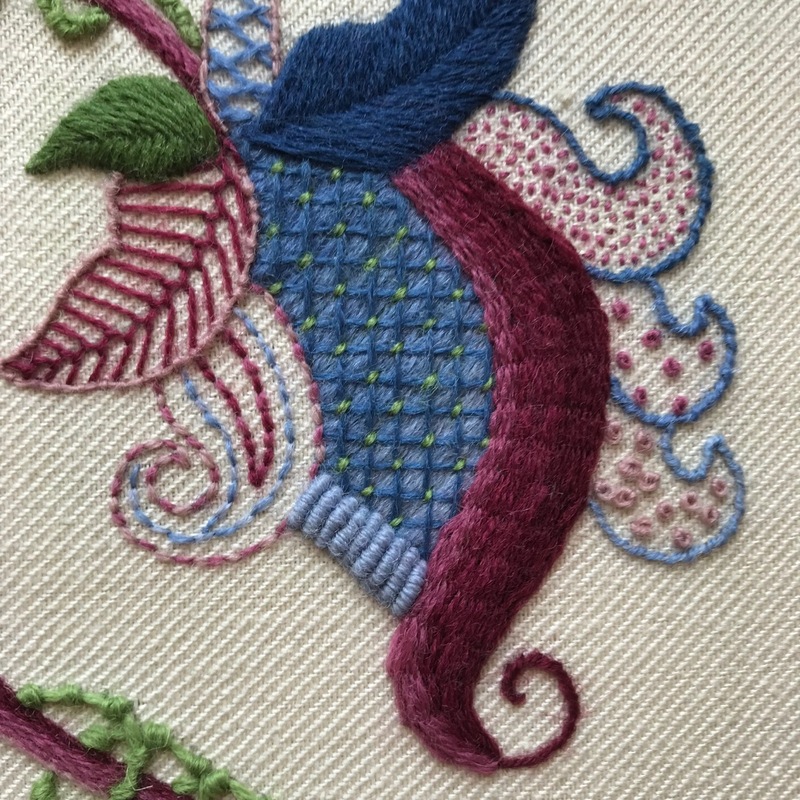 Last Monday I received the results of the assessment of my Jacobean Crewelwork which I had complete as part of the Royal School of Needlework Certificate course. I received 101 marks out of 108, which is about 94%. Obviously, I was extremely happy with the results and it has given me a lot of confidence going forward to the next module. In this post, I would like to give you a little bit more detail about the marking process and which specific points of my project the assessors picked up on. When you start a certificate module you receive a list of the assessment criteria the accessors will look out for and give marks on. There are 4 main criteria (first impressions, design, stitches and mounting) each with several subcriteria. For each subcriterion, the assessors will give marks out of 4. 4 Marks: Outstanding – work shows a very high standard of technical skill. Each piece is marked by two assessors to ensure consistency across the field. Some pieces are picked at random for moderation, again to ensure consistency in marking and keeping up the high standard the RSN would like to maintain. In the next section of this post you will find all of the details of the assessment of my piece and my reaction to the assessor’s comments. I have put the actual comments of the assessors in italics and in quotation marks and highlighted them in pink to distinguish them from my own. I scored 14 out of a possible 16 marks. The assessors found my work well presented and clean (full marks), and they found the linen clean and in good condition (full marks). I lost one mark on thread condition, and one mark because I had not covered all of the paint lines. I completely agree with the problems they picked up on and even feel they have been rather generous in their marking. I found it quite difficult to work with the Appleton wool as the threads frayed so quickly. I kept using shorter lengths and thicker needles but still found my thread catcher was filling up faster than my design. I am really happy that I used a very fine paintbrush (000) to paint the design lines as otherwise, I would have struggled much more to cover all of the lines. I received full marks (28 out of 28) for this criterion! I can’t believe I scored full marks on this one. Even though the tutors on my first day helped me with the design, I chose the colours and decided how to distribute them throughout the design. 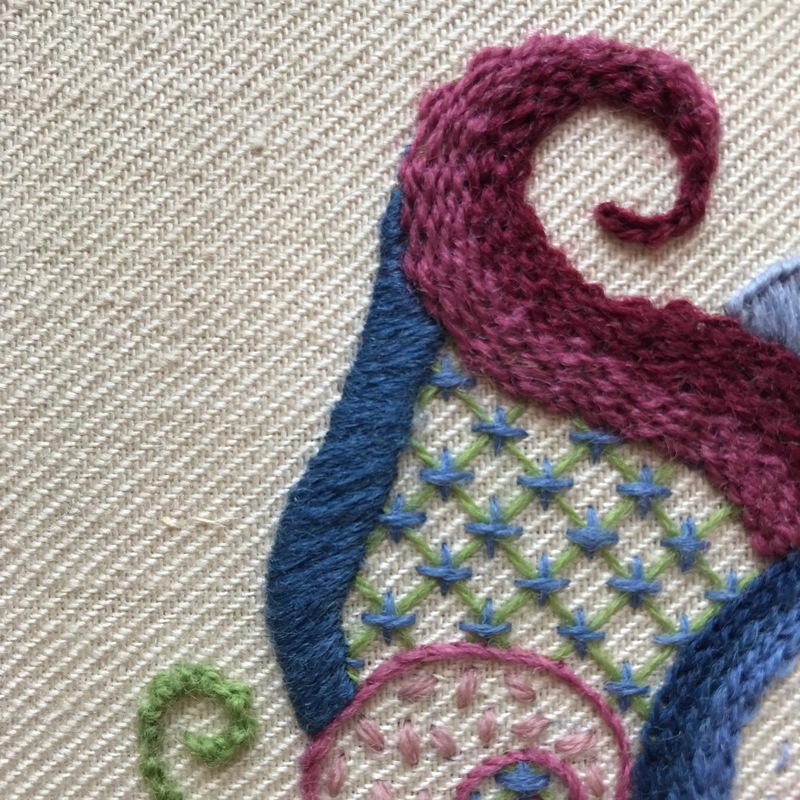 The stitch plan evolved when I was working on the project as I tried to get a better balance and a larger range of stitches than the tutors had originally decided upon. I, therefore, feel it is my choices that they have marked so favourably. I received a total of 33 out of 36 for this criterion. I scored full marks for tension (incl. 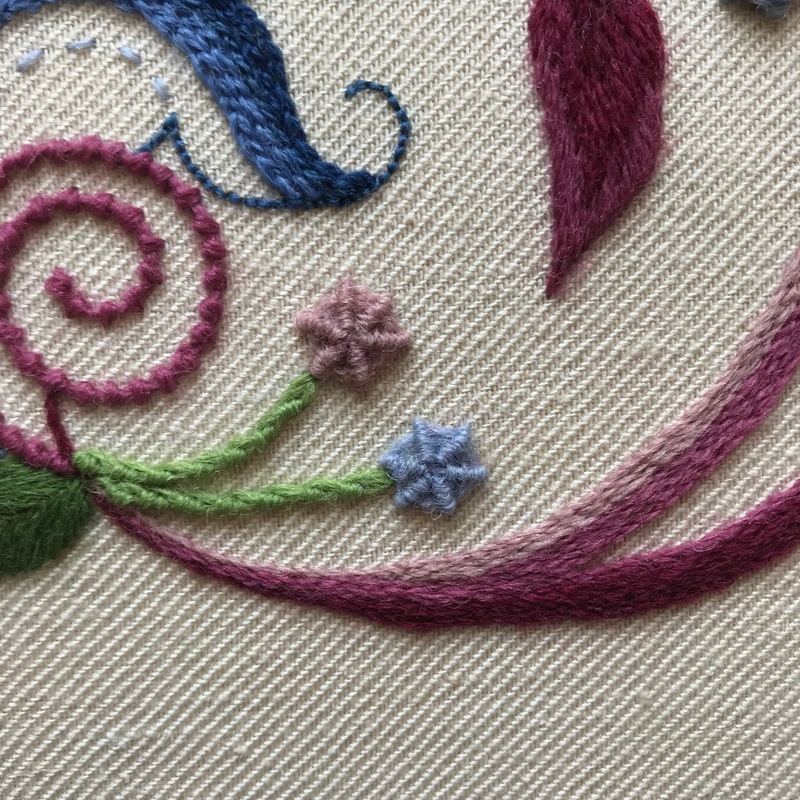 no loose threads or stitches, consistency of parallel stitches, smooth outline stitches that are not forced off-course, dense areas of stitches provided adequate coverage and appear smooth, sharp points and the fact that the stitches I have used have been worked technically correctly. I lost one mark in each of the remaining three subcriteria: sweeping angle changes flow smoothly around the curves, smooth edges have been achieved with close stitches over a stable foundation and areas demonstrate gradual shading where appropriate. Shading in the accent colour? I totally agree with the comments about my blue satin. It was one of the first stitches I did and I did notice the tiny nibbles and the slight change in angle. I was just too afraid that it would look worse if I tried to repair the fault or start all over. I am not sure about the comments about the shading. 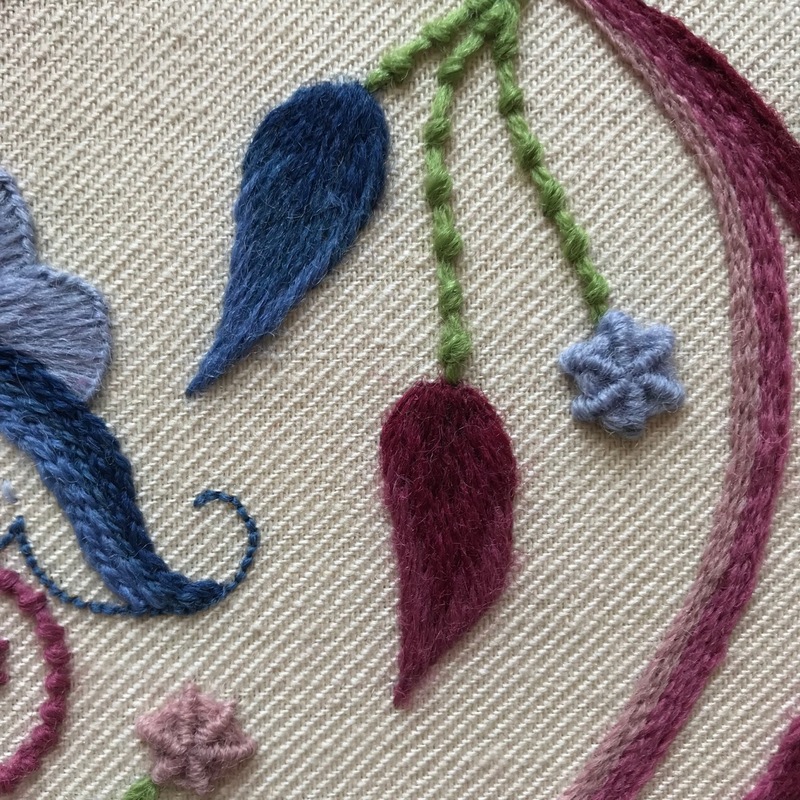 In the self-assessment, I had mentioned that I didn’t shade everything as I felt my project was already looking extremely busy with all of the different stitches I had used and I didn’t want to make it look even busier. I hadn’t even considered doing rows of blending and I am not sure how I should have technically done it. Most of the areas are stitched with only one thread so I am not sure how I could have blended them. I will ask one of the tutors when I am back at the RSN in July. I also never thought about shading with my accent colour (green). As there are only two shades I never considered it a possibility. I received a total of 26 out of 28 marks for this criterion. I received full marks for all of the subcriteria which applied to the front of the design (board with 90-degree angles, fabric straight on the grain, pulled taut, no pinpricks visible). I also received full marks for my slip stitches between the linen and sateen (not visible and even). I lost a mark for my corners and a mark for the application of the sateen. Really happy with the marks as I found the mounting process very difficult. It was so difficult to keep it on the grain and taut. I totally agree with the marks I lost. I was so focused on keeping the sateen taut and to keep my slipstitches invisible I never even considered checking whether the rebate was even. I was actually quite pleased with my corners, for a first time, but there is always room for improvement! All in all, I am very happy with the results and the comments of the assessors. They have given me lots of tips and tricks to take on board for my next project! 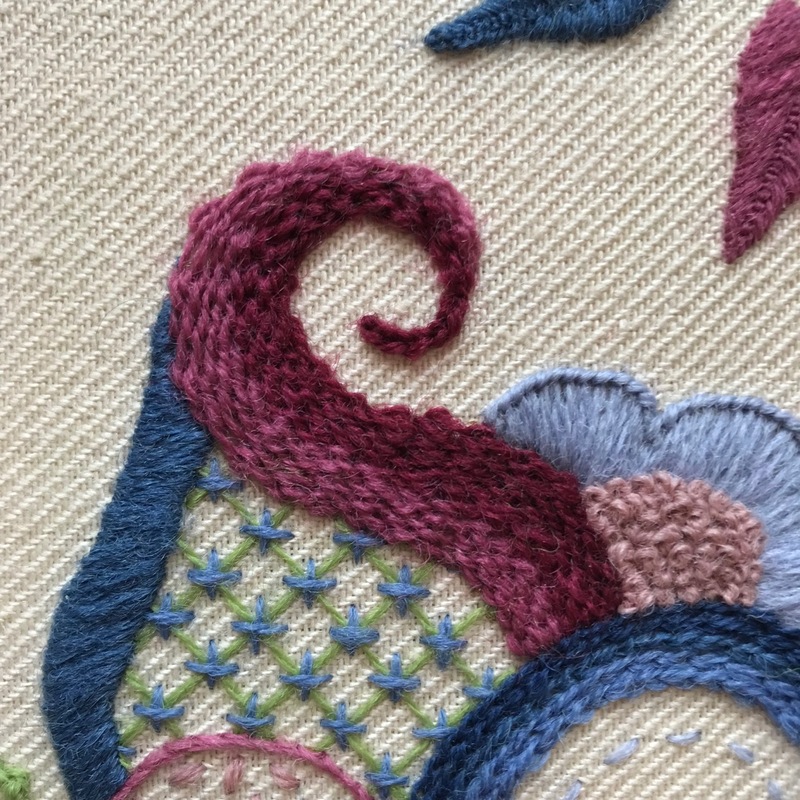 Canvaswork will be next, so stay tuned for a post about sampling the stitches, the design and from July the actual stitching of the design during the summer intensive course. Well done Marlous! A great achievement for your first piece, and with notes to help you in the future. Good luck with your intensive canvaswork piece! Thank you so much Catherine! Only 6 weeks to go until it starts. Better get practicing! I am hoping to get it done in the two weeks, but I am not going to drive myself made over it, working all hours! I can always go back in the autumn and finish it. Marlous, Thank you very much for sharing the feedback you received. The good marks are well deserved and it is great to see that you have still been able to learn some points from the tutors feedback. You have done such a great job on this piece. I look forward to seeing your canvas work piece develop. Not long now till the intensive classes start, I am counting down the last few weeks till my big trip to the RSN gets underway. Congratulations again on your achievements. regards, Sally. Thank you Sally! I know the summer is fast approaching and I haven’t done as much sampling as I had wanted yet! I have so many fun projects on the go that there doesn’t seem to be any time! Well done indeed! I’m sure it’s very intense when doing a project like this, so pleased for you. Thank you so much! It is. When I embroider I like to do my best and make it look good, but it is totally different feeling when you know someone is going to mark it! wow, well done! It must be very hard to get such high marks at the RSN, you truly are talented! Thank you so much for your comments. I don’t know about being talented 😉 practise and being critical (but not too much) of your work really helps. Your project is so beautiful and well stitched. After hearing how they graded you, I’m beginning to worry about doing the certificate during an intensive two weeks. (BTW…I couldn’t see ANY line on the blue star. lol) Thanks for sharing!!! Thank you for your lovely comments! I am worrying a bit about the summer intensive too but at least I have the luxury of being able to go back at a later date and finish as I have decided not to drive myself mad trying to get it done in the time as I have been hearing it is so much work and people work in the evening. Are you doing the Jacobean? Try and get a head start and think about your design and draw it, maybe think about colours and try to practise some stitches. Congratulations Marlous, I just knew that you’d achieve a high mark for this work. I doubt that I’ll ever attain such high standards of stitching but I enjoy being inspired by people such as yourself and am looking forward to reading about the canvaswork you do. Thank you Mrs G for your lovely comments! If I can others can to! As long as you are having fun stitching that is the most important thing! Well done Marlous! I really liked assessing pieces at the RSN. 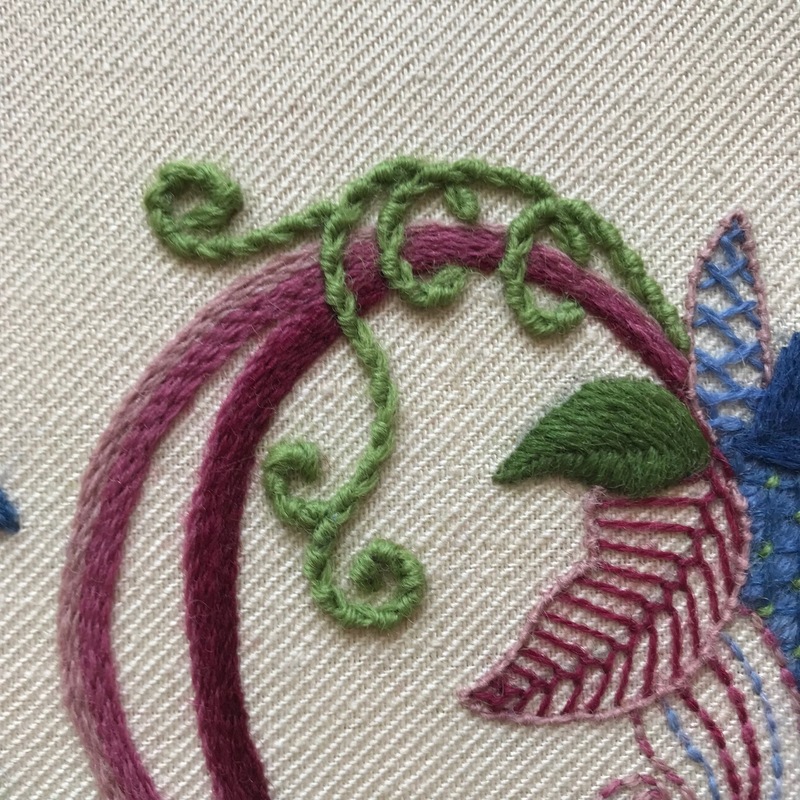 It improved my own understanding of design and embroidery immensely. Thank you Jessica! I think it is something very useful to do as you will take so much from it, and also be able to look objectively at your own work. In terms of achieving the shading, if stitching from dark to light it’s a case of starting to mix in the lighter shade with the dark, e.g. do a single line of the lighter shade, then a couple more dark, another light, etc… Your tutors will give you guidance, I’m sure. Thank you Irene! Oh, that is what I did for my laid work. I never thought about that, thank you! Thank you so much Julia for your lovely comments. Glad you enjoyed reading my post! I’m impressed with the constructive and positive tone of the assessor’s comments. It’s the hardest thing in the world to balance constructive criticism with encouragement! I know! I felt really positive after reading it, despite reading about the marks I had lost. Many teachers and lecturers I have had in the past should take a course at the RSN learning on how to give feedback that doesn’t leave the student in tears after! Well done, one of the prettiest I’ve seen for design. What does the word ‘rebate’ mean in the stitching sense? Thank you very much Mary! 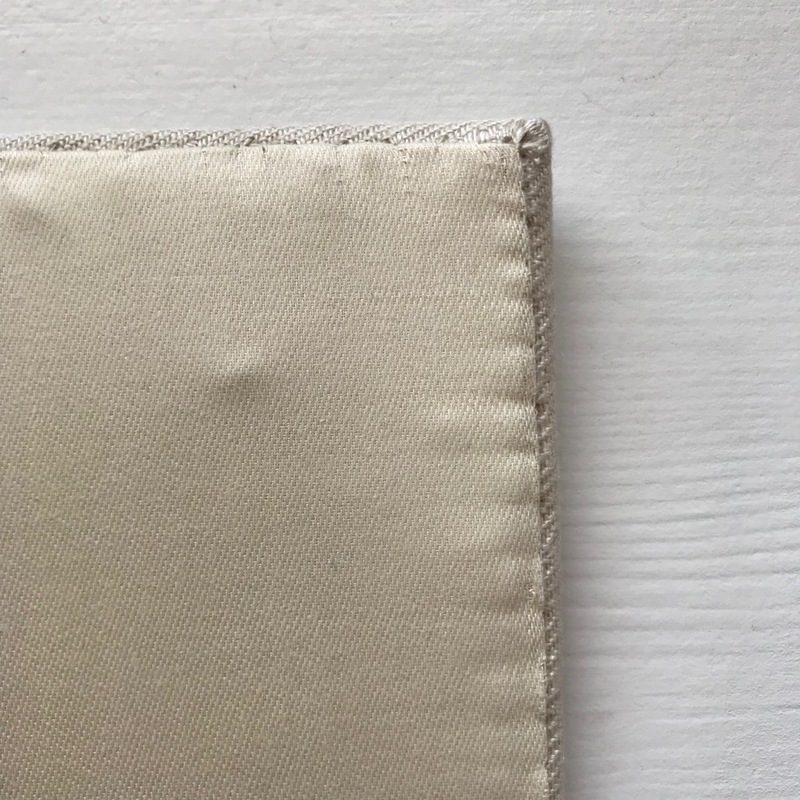 The edge of the linen that is showing at the back should be the same width all the way around. 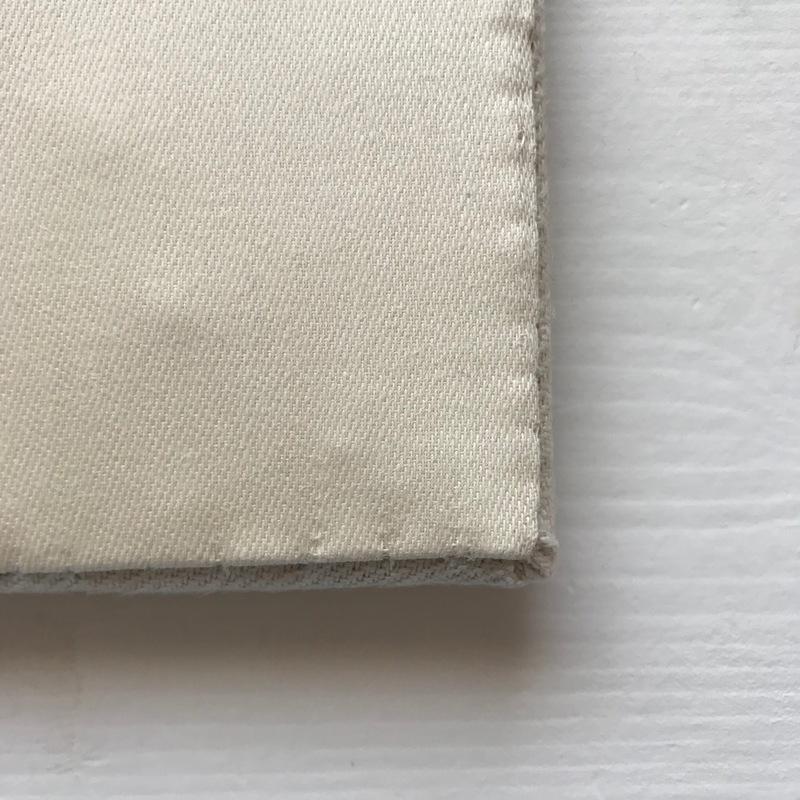 The edge of the sateen (rebate) that I folded over was not straight which means that the width of the linen that was exposed around the sateen was not even. Well done, a well deserved result for a beautiful piece of work. Bet you were chuffed with the comments. I lost so many marks on the mounting process – but it is all a learning process and next time I will know what they are looking for! Thank you so much! I was! There were no major surprises and some good things to consider for next time. Shame you lost so many marks on the mounting. Were you happy with the rest of the marks? Yes I think so. Scored 14/16 for overall appearance, 26/28 for overall design – they thought it too realistic (and I did struggle with the fantasy aspect), 33/36 for the stitching – but only 21/28 for the mounting (ouch!). Congratulations! You marks are really good! Did they give you some good pointers on your mounting for next time? Yes, I was a little disappointed with this aspect as I had felt that my piece needed lacing and had asked the tutors their opinion – but was advised to leave it. Oh well, at least I know what to aim for next time. That is a shame that you already felt it needed lacing but the tutors have said to leave it! That is one of the reasons I have liked coming for a week at a time and having lots of different tutors: there is an opportunity for a second/third/fourth opinion! It is all very subjective – but I look forward to the next piece. This is fabulous! Beautiful work! Congratulations! Thank you for sharing your evaluation with all of us! It is very informative and interesting! Just a gorgeous piece! Thank you for your lovely comments. Even though they are personal and show the things that are wrong with my piece I really wanted to share them, so others can benefit from them too!